CAMP MURRAY, Wash. -- The Pacific Northwest kicked off a massive earthquake and tsunami drill Tuesday as part of a multiday event to rehearse scenarios on how the region would deal with a dual natural disaster that could kill thousands, cut off coastal communities, and collapse phone and internet service. The four-day event, called Cascadia Rising, is built around the premise of a 9.0 magnitude earthquake 95 miles off of the coast of Oregon that results in a tsunami. Both events would likely destroy buildings, roads and buildings and disrupt communications. Major General Bret Daugherty, commander of the Washington National Guard, said that when the Cascadia Subduction Zone -- a 600-mile-long fault just off the coast that runs from Northern California to British Columbia -- ruptures "it will result in a catastrophe like nothing we have ever seen." "It's expected to be the worst natural disaster ever in the United States," he said. So we're taking this week very, very seriously and we're pulling in every possible resource so that when the quake actually hits we're assured that we are all on the same page in our response efforts." Federal officials say about 20,000 people will be involved in the disaster drill, representing various federal agencies, the U.S. military, and state and local emergency response managers from Washington, Oregon and Idaho, Native American tribes and emergency management officials in British Columbia. One main goal of the exercise is to test how well they will work together to minimize loss of life and damages when a mega-quake unleashes a tsunami. More than 8 million people live in the zone, which contains the most heavily populated areas of the Pacific Northwest, including Seattle and Portland. Things that officials will be testing include the ability to communicate without the internet or phone or cell service; practicing ways of delivering services in emergency conditions, and National Guard search and rescue, decontamination and evacuation abilities. In Seattle, there are a number of Federal agencies participating, including the American Red Cross, the U.S. Coast Guard, Department of Energy, Department of Transportation, National Oceanic and Atmospheric Administration (NOAA), Federal Aviation Administration (FAA), Department of Health and Human Services, Department of Homeland Security, Department of Justice (DOJ), and more, CBS Seattle reported. Gov. Jay Inslee, standing in front of military and other federal vehicles brought into Camp Murray for the exercise, called the event a "remarkable partnership." "Cascadia Rising is about making sure we're as prepared as we can be," he said. "The hope is to identify those areas where we perform well. But obviously we also want to identify our weaknesses." At just past 8 a.m., employees of the state's Emergency Management system dropped under their desk for the estimated 5 minutes of shaking, said Lit Dudley, the exercise and training section manager for the division at the Washington Military Department. More than 100 people from roughly a dozen agencies were stationed at computers throughout the emergency center Camp Murray, as State EOC supervisor Chris Utzinger stood in the middle of the room to read off most recent messages related to the simulated tsunami that followed the earthquake. Officials will be running off of the assumption that there will be mass casualties, including 1,100 killed by the earthquake, 13,000 killed by the tsunami and 24,000 injured. During this week's drill, National Guard soldiers in Washington state will run airborne operations, including dropping supplies to set up a mobile operations center and deliver medical supplies. Other participants in the exercise will contact emergency management offices with reports of specific needs during the simulated disaster, and amateur radio operators will take part, as it's expected they can help bridge the gaps for emergency officials if internet and phone services are severed. 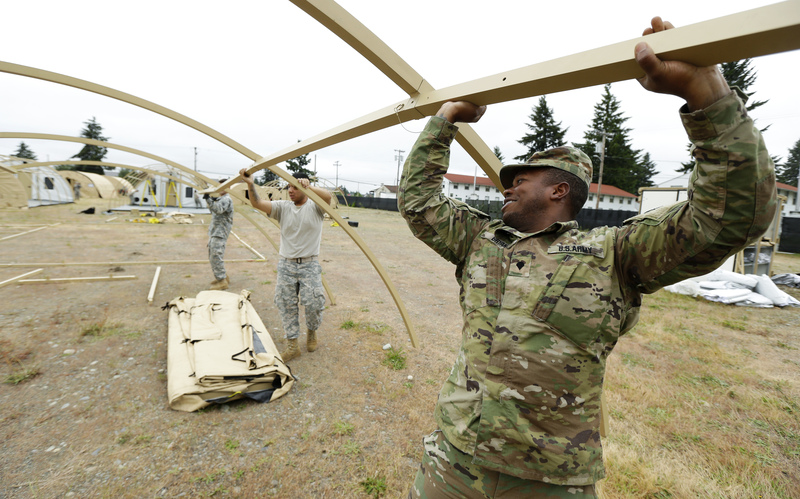 Washington state has the most participants in the exercise, numbering more than 9,600 people, of which 2,300 will be from the National Guard. About 8,300 participants from the Department of Defense are involved as well. In Oregon, where more than 1,400 people will participate, and some of the drills there will include pulling people out of a pile of rubble that simulates a collapsed building and triaging them for medical care. Research suggests that the Cascadia Subduction Zone on average produces magnitude 9.0 quakes every 500 years, but big quakes have been separated by as few as 200 years and as many as 1,000. So it is impossible to predict when the next monster quake occurs. However, tectonic stresses have been accumulating in the CSZ for more than 300 years and seismologists say it could rupture at any time.